Today, BAFEL is regarded as one of the finest institutes in India, imparting knowledge to numerous people and training them in the way of speaking English. From homemakers to students to professionals from different fields make use of our coaching to excel in their chosen area of expertise and communicate fluently in English. BAFEL is based in Delhi and is happy to announce its presence in the Ber Sarai area. Given the overwhelming appreciation from locals and our esteemed clientele, we are here at Ber Sarai, a step closer to you. Students who wish to pursue TOEFL, IELTS, OET, etc. can now reach out to our office here and enquire about the courses. We understand that English has a great significance in our day-to-day lives and therefore, we are here to bring about a change in the way you speak the language. With a direct approach in training to speak the language and at the same time improve the grammar, BAFEL Ber Sarai gives special emphasis to interactive training methods. In such an approach, the students participate extensively in one-on-one sessions, where their capabilities of speaking as well as listening undergo tremendous change. With right pronunciation and correct grammar, students are able to express as well as communicate freely and fluently in English with us. Ber Sarai is a location, now, closer to you and you can get your desired training in learning English quite easily. 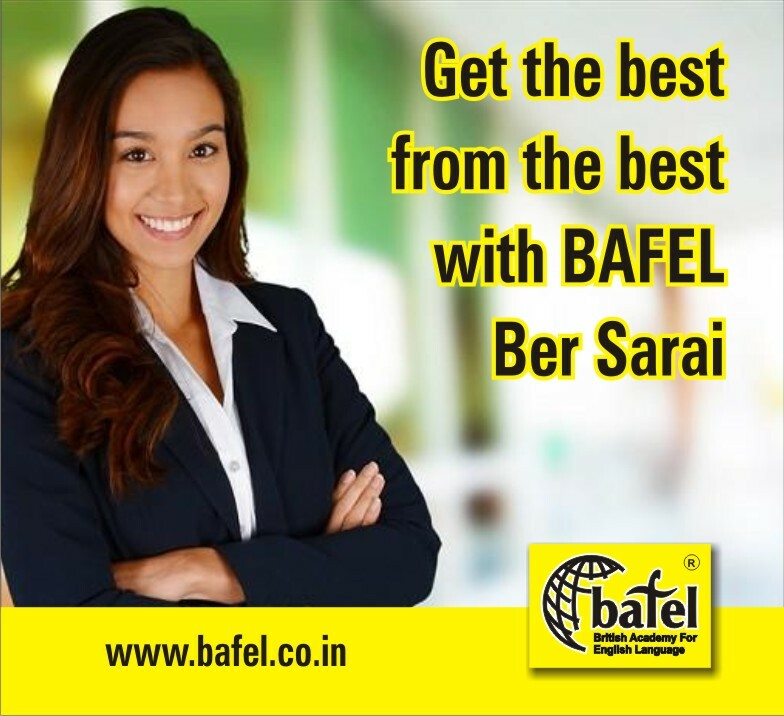 Why would you want to learn English with BAFEL Ber Sarai? We are the best in teaching English and we have a reason for this. Most of our curriculum is based on the current academic requirements, right from school, colleges, professional exams and other areas where English is a necessity. Keeping in touch with the current trend of education as well as the international requirements of learning English, BAFEL Ber Sarai has a group of teachers that are highly trained to provide a comprehensive view on the subject. Knowing English is a basic requirement for studying abroad and our course material is specifically designed to excel in competitive exams like OET, TOEFL, IELTS, etc. How can a common person who is not a student or professional benefit from learning English? Suppose you are a homemaker, a mechanic, or an owner of a small cloth shop and you are not fluent in English. What difference would English make in your life when you do not have the application of that language in daily life professionally! Well, English today is almost a second language and used randomly in our communication. If we go out to shop, English is a language for both displaying information as well as communication. Apart from this, in this fast paced digital age, most of the information online is available in English. Therefore, when a homemaker or mechanic has access to information but cannot understand English, then it becomes a barrier for their growth. People would miss many prospects that can prove useful or profitable to them. New business opportunities, available would go unnoticed, just because one cannot understand English. Not to forget, fluency in English often gives a polished feel in communication, giving an edge over others in business deals. Of course knowing English does not mean it compensates other qualifications, but it can help to avoid barriers in communication with learned businesspersons when such an occasion arises. With English, you get to communicate your ideas and other areas of your business with ease. You could understand your competition as well as express in the same manner saving time, energy as well as money. Homemakers will be able to communicate freely and fluently in English, even in public places where there feel withdrawn because they lack the required skill to speak English. We are here to make a difference in the lives of students and common people alike. Learning with us will always give you enough confidence to pursue what you desire in this competitive world, and we are here to make it easier for you. To know more, visit us at Ber Sarai today and know our latest offers. Take your first step towards a fluent tongue in English with us today.